a genus of herpesviruses closely related to genus Roseolovirus, containing the single species human herpesvirus 5. It is transmitted by multiple routes and causes infection that is usually mild or subclinical but may be symptomatic (cytomegalic inclusion disease). any of a subfamily of host-specific herpesviruses infecting humans, monkeys, and rodents, producing unique large cells with inclusion bodies. 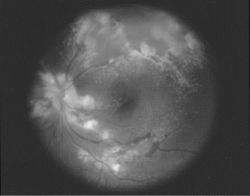 Opportunistic infection with this virus is common in immunocompromised individuals, causing clinical illnesses such as cytomegalovirus retinitis, pneumonia, esophagitis, colitis, adrenalitis, and hepatitis. It can also cause cytomegalic inclusion disease, a variety of gastrointestinal infections, and encephalitis. Most infections are mild in immunocompetent persons, but it has been associated with a syndrome called cytomegalovirus mononucleosis. cytomegalovirus disease cytomegalic inclusion disease. A group of viruses in the family Herpesviridae infecting humans and other animals, many of these viruses having special affinity for salivary glands, and causing enlargement of cells of various organs and development of characteristic inclusions (owl eye) in the cytoplasm or nucleus. Infection of embryo in utero may result in malformation and fetal death. They are all species specific and include salivary virus, inclusion body rhinitis virus of pigs, and others. /cy·to·meg·a·lo·vi·rus/ (CMV) (-meg´ah-lo-vi″rus) any of a group of highly host-specific herpesviruses, infecting humans, monkeys, or rodents, producing unique large cells with intranuclear inclusions; the virus can cause a variety of clinical syndromes, collectively known as cytomegalic inclusion disease, although most infections are mild or subclinical. /Cy·to·meg·a·lo·vi·rus/ (-meg´ah-lo-vi″rus) human cytomegaloviruses; a genus of ubiquitous viruses of the subfamily Betaherpesvirinae (family Herpesviridae), transmitted by multiple routes. a member of a group of large species-specific herpes-type viruses with a wide variety of disease effects. Infection results in characteristically enlarged cells with intranuclear inclusions. Opportunistic infection with this virus is common in immunocompromised individuals, causing clinical illnesses such as cytomegalovirus retinitis, pneumonia, esophagitis, colitis, adrenalitis and hepatitis. It can also cause cytomegalic inclusion disease, a variety of gastrointestinal infections, and encephalitis. See also cytomegalic inclusion disease, TORCH syndrome. A globally distributed herpesvirus (HHV-3) which, in developing nations, is universally acquired in infancy. CMV is transmitted in blood, and rarely is a serious infection unless the host is previously immunocompromised (e.g., as in AIDS, or following bone marrow transplantation) or has leukaemia or lymphoma, in which cases CMV may cause severe pneumonia. TORCH antibody panel Pediatrics A serologic screen for diagnosing prenatal infection; the finding of ↑ IgM in the neonate implies in utero infection by one of the TORCH agents–toxoplasma, rubella, CMV, herpes simplex, which is then characterized by measuring specific IgM levels. Rubella may cause LBW, hepatosplenomegaly, petechiae and purpura, congenital heart disease, cataracts, microophthalmia and microcephaly; CNS symptoms include lethargy, irritability, dystonia, bulging fontanelles and seizures. See Congenital rubella syndrome. A group of herpesviruses infecting humans and other animals, many having special affinity for salivary glands, and causing development of characteristic inclusions in the cytoplasm or nucleus. Most infections are asymptomatic, but if symptoms are present, they manifest as mononucleosislike illness. Congenital infection may cause malformation or fetal death; infection in immunocompromised persons may be life-threatening. A common human virus causing mild or no symptoms in healthy people, but permanent damage or death to an infected fetus, a transplant patient, or a person with HIV. n species-specific, herpes-type virus capable of causing life-threatening illness in HIV patients, transplant recipients, and newborns; typically causes gastrointestinal or retinal infections. n a visceral disease virus, a member of the group of herpesviruses having special affinity for the salivary glands. Considered one of the indicator infections of AIDS. member of the Betaherpesvirinae subfamily, they infect humans, monkeys, pigs and rodents in which they appear to establish life-long infections. The viruses are highly host specific, slow growing, remain highly cell-associated and produce large intranuclear inclusion bodies in enlarged cells. Diseases produced by cytomegaloviruses are subtle. causes subclinical infection of submaxillary salivary glands and other tissues in wild mice. causes inclusion body rhinitis and a generalized infection in young pigs. Q. What is it CMV during pregnancy? can i infect with that? A. CMV is a virus. What you refer to is infection with CMV, either the initial infection, or re-activation of latent (dormant) virus that resides in the mother's body during pregnancy. The dangers are that CMV will infect the fetus, which may cause malformations, particularly growth restriction and hearing impairment. Q. What is it CMV during pregnancy ? can i infect with that? A. CMV or cytomegalovirus (http://en.wikipedia.org/wiki/Cytomegalovirus) is a virus that can cause disease (i.e. infectious mononucleosis, http://en.wikipedia.org/wiki/Infectious_mononucleosis) in everyone, not only pregnant women. The problem is that when a pregnant woman is infected in CMV for the first time of her life during pregnancy, CMV can cause malformations and problems with the baby, including hearing impairment and others (see also TORCHES: http://en.wikipedia.org/wiki/TORCH_infections). Q. Do you want to end because of a vaccination in a wheel chair? It is already about 12 years ago. I met a mother with her kids. One came always in a wheel chair to the services. His terrible story is still in my mind. It could be shown, that because of a vaccination he got the	cytomegalovirus infection (CMV) and then spastic paralysis.